The JEOL JXA-8200 Electron Microprobe (EPMA) was installed in 2002-2003.
and Probe for EPMA software for automated analyses. 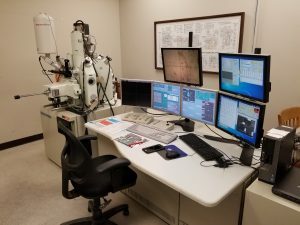 The primary purpose of the electron microprobe is to generate quantitative chemical analyses of any material that is stable under the electron beam and under high vacuum. Such materials include minerals, glasses, ceramics, and metals/alloys. What is an ElectronProbe MicroAnalyzer (EPMA)? The ‘ElectronProbe’ part:Electrons are stripped from a filament and then cascaded through the optical column via a high voltage potential to the sample surface. Electrons are shaped into a beam, or probe, in the optical column by a series of magnets, lenses, and apertures. The ‘Micro’ part: The diameter of the beam (‘spot’ size) at the sample can be between a few nanometers (nm) and several micrometers (µm). Spot size is ultimately controlled by the source of electrons (the filament), the condenser lens (which shapes the flux of electrons), the aperture(s) (which trim the diameter of the beam), and the objective lens (which controls the focal plain of the beam at the sample). Beam diameters between 1 to 20 µm a microprobe are most often used when quantifying the chemical composition of minerals and glasses. The ‘Analyzer’ part: When electrons in the beam impact the sample, a number of events occur. A fraction of the incident electrons strike electrons in the electron cloud of atoms in the sample resulting in the emission of an X-ray. Some of these X-rays are ‘characteristic’ of the element from which they were generated. Characteristic X-rays are sorted by their (a) particle- and (b) wave-like properties using two different types of detectors. 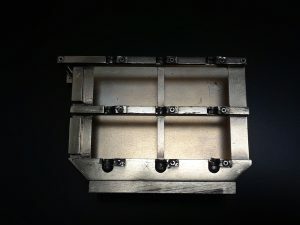 An Energy Dispersive Spectrometer (EDS) sorts X-rays based on their energies and a Wavelength Dispersive Spectrometer (WDS) sorts X-rays based on their wavelengths. The EPMA is capable of producing three types of chemical analysis: qualitative, semi-quantitative, and quantitative. Qualitative analysis is the process of detecting and identifying characteristic X-rays to identify a mineral or other phase. Semi-quantitative analyses not only measure and identify characteristic X-rays but also provide atomic and weight percentages of elements in the sample. Quantitative analysis compares the X-ray intensities between a standard of known composition with X-ray intensities from an unknown to generate precise and accurate compositional data. Of course, the actual process of quantifying compositions from X-ray intensities is not as simple as it seems. What’s the difference between an SEM and an EPMA? X-ray map of Mn in garnet from metamorphic rock. The SEM and EPMA are very similar instruments. 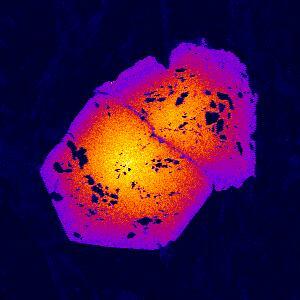 Both produce electron images and rapid qualitative and semi-quantitative chemical analyses (via an EDS detector). However, quantitative chemical data is generated using the EPMA which is equipped with WDS X-ray detectors. Compared to EDS detectors, the WDS system offers better peak-to-background X-ray intensities and the ability to resolve X-rays whose energies, and wavelengths, are very similar (e.g. Ba and Ti). Therefore, the EPMA is best suited for the accurate and precise measurement of elements at major to trace concentrations. Analysis of 10 elements can be performed in just a few minutes (3-5) using an EPMA with multiple (4-5) WDS spectrometers. Like the SEM, the EPMA can be used to create X-ray element maps of samples, which are useful for identifying chemical zonation. 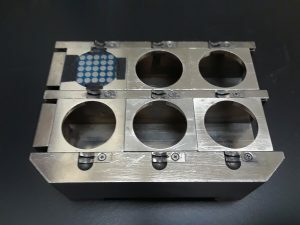 However, because the EPMA is able to detect to multiple trace elements simultaneously, the EPMA is often used to map trace element distributions in samples. Stage automation allows user to produce X-ray maps of large areas. Samples must be stable under the electron beam. Temperatures in excess of 100°C to 200°C can be generated by the electron beam at the sample surface. Special analytical methods can be applied to beam sensitive samples. Users interested in the analysis of such materials should contact the lab manager to discuss analytical goals. Samples must be electrically conductive and grounded to the instrument (stage). Because most geological materials are insulators, most samples require a conductive coating (typically carbon) before imaging and analysis. 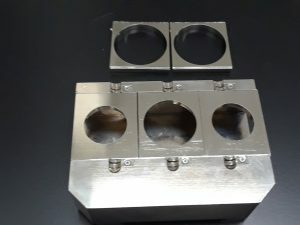 Samples must be flat and polished. Good polish is one important key to good results! Common samples are standard, polished thin sections and 1″ round sections. Very thin (<3 mm) and thick (3 mm) polished slabs mounted on a standard sized petrographic thin section can also be used. 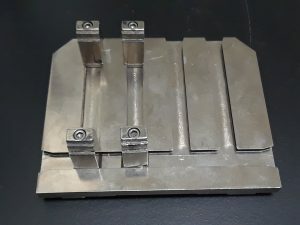 The instrument can hold a maximum of four standard thin sections, one 2×3″ thin section, six 1″ rounds, two 1.25″ round sections, OR two 1.5″ rounds. Samples can also be mounted in 0.25″ brass sleeves, which are secured in a 1″ round mount with six 0.25″ holes. Follow this link to see a list of available mineral and glass standards.